Embroidery repairs is a topic we keep coming back to but we thought we would share another project with you where embroidery was used to breath new life into a damaged garment. It is so pleasing when we are able to use a method that is usually about decoration only but also allow an item that would have otherwise have lost its use, to be beautiful and useful again. 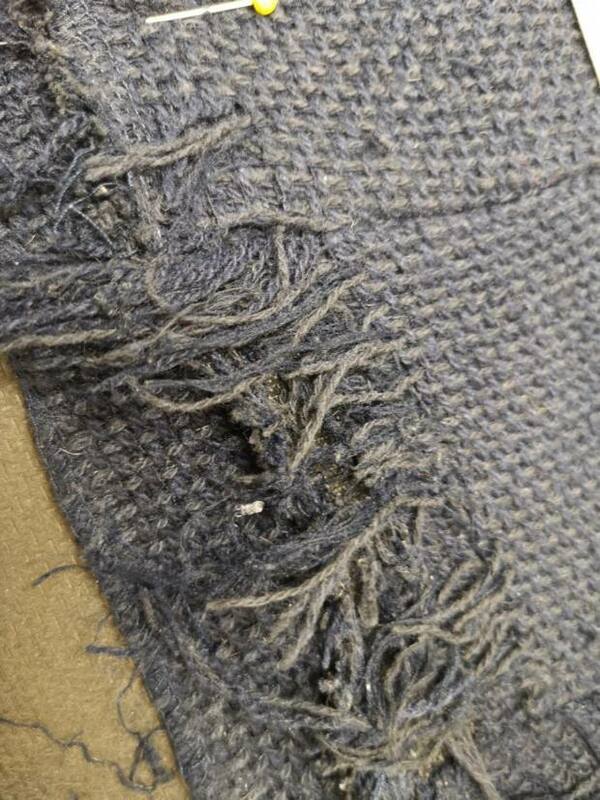 This jacket was made of a very rough grain tweed which through rubbing and wear had got damaged and started to ray over a large area of about 15 cm. 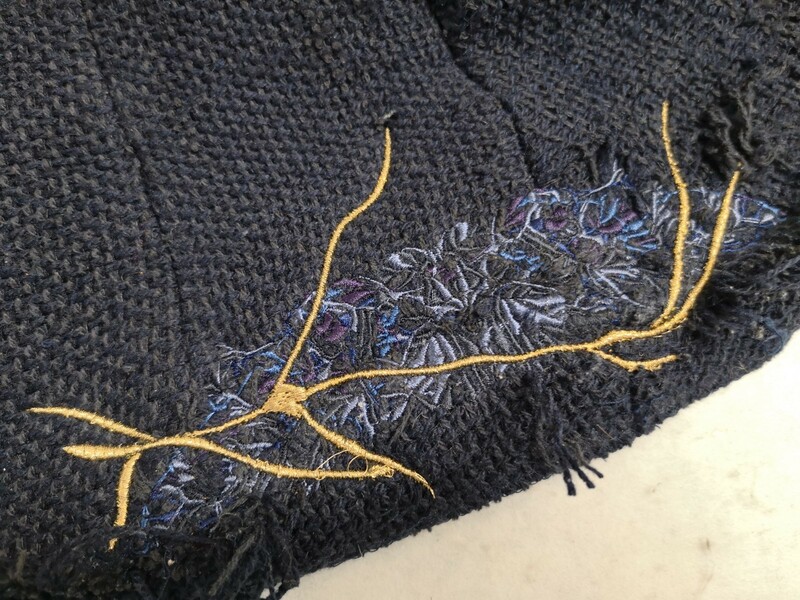 The embroidery that was designed for the area was inspired by the Japanese practise of Kintsukuroi (golden repair) where broken pottery is fixed using gold laquer. It ties in with the philosophy of wabi-sabi, embracing of the flawed or imperfect which felt appropriate for this project given that we knew that the damage would still be to come extent visible but making the repair in an asthetically pleasing way makes the object becomes more beautiful for having been broken and fixed. 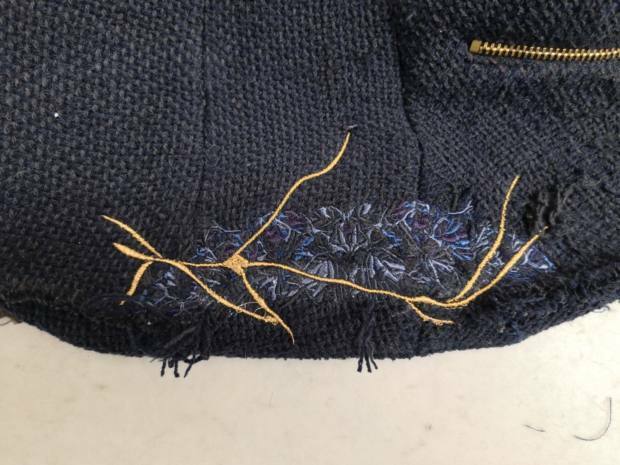 We used 4 shades of blue to reflect the different thread colours in the weave which are all in satin stitch to help to hold the damaged area together. Then there is a layer of gold metallic thread added over raisings to give it that laquered effect that is so significant to this technique and ties in with the metal details of the jacket. After the embroidery there were still a few threads to pulled through to tidy as can be seen and to reattach the hem, but we were very please with the end result.